The national magazine is rounding up top dunks. Bon Appétit gives Randy's Donuts a spotlight in the March 2010 issue. Just a few weeks ago, it was Joan's on Third that nabbed the Bon Appétit love. Now Randy's Donuts has made a list of top around-the-country doughnutries in the latest pages of the national food magazine. Bon Appétit is particularly entranced with the buttermilk, as well as the crumb-raised specialty. 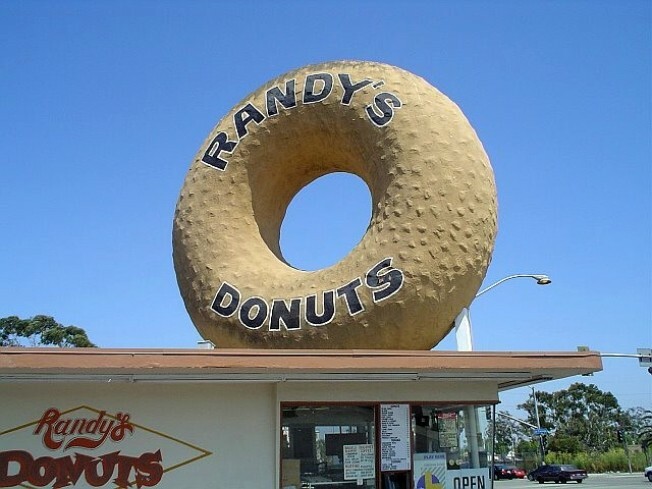 There are a host other famous spots on the March 2010 Best Places for Donuts list -- Voodoo Doughnut in Portland (mmm, the Bacon Maple), New York's own Doughnut Plant, Dynamo in San Francisco -- but Randy's is the sole entry for Southern California. Which makes us pause to nag again: Go and have a doughnut. We know. You're always making a plan to do so. But then you're always late, tooling down the 405, to Long Beach, to wherever, and you don't have time. Are you going to be the person who has lived here for X number of years but has to admit you've never had a Randy's fritter? Make it a destination one weekend day soon, not a pass-by to the airport. Thank you. We have said our piece.